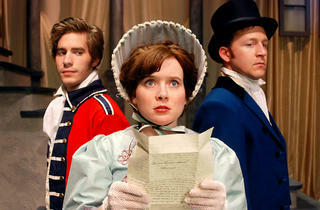 Lifeline stages Jane Austen’s trenchant Regency romance. One year after the Brothers Grimm popularized the stories of Cinderella and Snow White, Jane Austen wrote a fairy tale for the Regency era with the romance of Elizabeth Bennet (Laura McClain) and the princely, though not very charming, Mr. Darcy (Dennis Grimes). 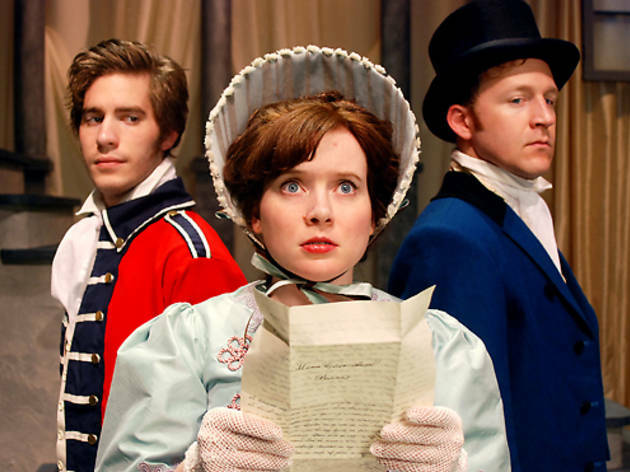 The success of any adaptation of Austen’s seminal 1813 novel depends on the chemistry between the two proud, prejudiced lovers; director Elise Kauzlaric cultivates a strong tension between them that gradually eases as the play progresses. Christina Calvit’s 1986 adaptation emphasizes the Bennet family’s modest means by incorporating conversations among townspeople about the family’s escalating expenses. The elegant silk drapes of Melania Lancy’s set design and Bill Morey’s bright costumes give the production a polished appearance, but there could be a stronger contrast between the Bennets’ humble lifestyle and the extravagance of Mr. Darcy and the Bingleys. While the shrill, bawdy Mrs. Bennet (Cameron Feagin) should stand out among the sophisticates she’s trying to marry her daughters off to, Feagin’s portrayal is exaggerated to the point of caricature. McClain’s willful, witty Elizabeth is a fine match for Grimes’s rigid Mr. Darcy, who becomes immediately more amiable and alluring once he confesses his secret love for her. There’s an exhilarating release when the two finally kiss—which speaks to Austen’s lasting ability to thrill.